temple of dreams . . . Published in Grounds For Sculpture’s magazine NewsCasting, Spring/Summer 2015 (The Creativity Issue). For those of you who have visited the GFS sculpture gardens in Hamilton, N.J., you may recognize the inspiration for my poem: Carlos Dorrien’s The Nine Muses. The Nine Muses, by Carlos Dorrien. 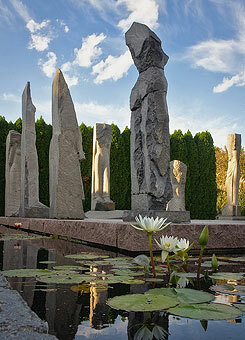 Photo by David W. Steele and (c) The Sculpture Foundation, Inc.
towering hemlock . . . Published in Acorn, spring 2015.
for new tenants . . . Spotlight on . . . me? !